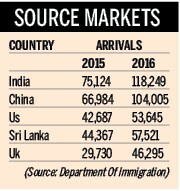 A breakdown of arrivals by market shows Indian travellers at the top of the list. Arrivals from the southern neighbour reached 118,249 last year, up 57.40 percent. Chinese tourist arrivals jumped 55.26 percent to 104,005. Travel trade entrepreneurs said that Chinese arrivals did not increase as expected last year as the key entry point, Tatopani Customs in Sindhupalchok, was closed after the earthquake. However, Rasuwagadhi has emerged as an important surface route with 23,452 Chinese visitors entering the country through this point last year.